The food sector is Germany´s third largest industry and also has a leading role in Europe. 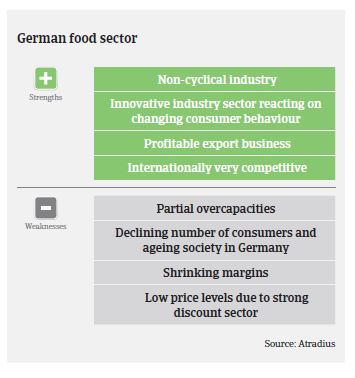 Apart from a few large players the German food sector mainly consists of small- and middle-sized businesses (about 5,800), employing about 570,000 people in total. According to the German Food Association BVE, nominal turnover decreased 2.1% year-on-year in 2015, to EUR 168.8 billion, mainly due to lower market prices, caused by increased production volumes and export restrictions (the Russian food import ban). This was followed by a 0.8% increase in H1 of 2016, up to EUR 82.5 billion. While domestic sales (EUR 55.8 billion) levelled off, export sales rose 2.6%, to EUR 26.7 million. Real turnover (domestic and export combined) increased 2.2%. Domestic market conditions have become increasingly difficult during the last couple of years, as yearly turnover figures have either levelled off or even decreased, mainly due to a shrinking population and increased price pressure. The German food retail market is the most competitive in Europe, with structurally low market prices due to the overwhelming power of the leading food retailers and discounters (EDEKA, REWE, Schwarz Group and Aldi), which account for 67% of the entire German food retail market. The market power of large retailers and discounters, tough competition and price wars in the food retail sector indicate that food producers, processors and suppliers have found it difficult to pass on costs. As a result, their profit margins have decreased in recent years and are continuing to decline. This is exacerbated by increasing quality standards, which require food producers and processors to make significant investments. There are overcapacities in some subsectors like beverage, meat production and wholesale, which forced a number of companies to leave the market, either by takeover, liquidation or insolvency. At the same time the dairy segment still suffers from sharply decreased market prices for milk. In contrast, the fruit and vegetables subsector is currently characterised by stable market conditions and an overall improvement in business development. 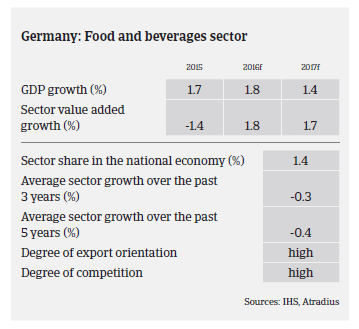 While increasingly facing troubles in the domestic market, the German food industry has successfully expanded overseas in order to secure sales growth, partly helped by its high quality reputation. Over the past ten years the sector has increased its export ratio from 20% to 33%, and has successfully expanded its sales activities in growth markets like China. Food producers and wholesalers pay, on average, within 30 days, while payment terms of food retailers often vary between 45 and even 90 or more days. With food processing companies and retailers demanding longer payment terms from their immediate suppliers to improve their working capital, a wave of longer payment terms is being created along the whole supply chain. We have seen an increase in the number of notified non-payments in the last couple of months, and expect this trend to continue in the future. The already low profit margins are further decreasing for many businesses, and insolvencies are expected to increase in 2017. Most at risk are (smaller) businesses that lack export opportunities or do not offer specialised products, and those companies with already poor financial strength. Therefore, our underwriting stance has become more restrictive, especially in the meat production/meat processing and dairy products segments, as we expect the difficult business environment in those sectors to continue in 2017. The food sector remains affected by considerable fraud cases, which are still rising and getting increasingly tricky and professional. 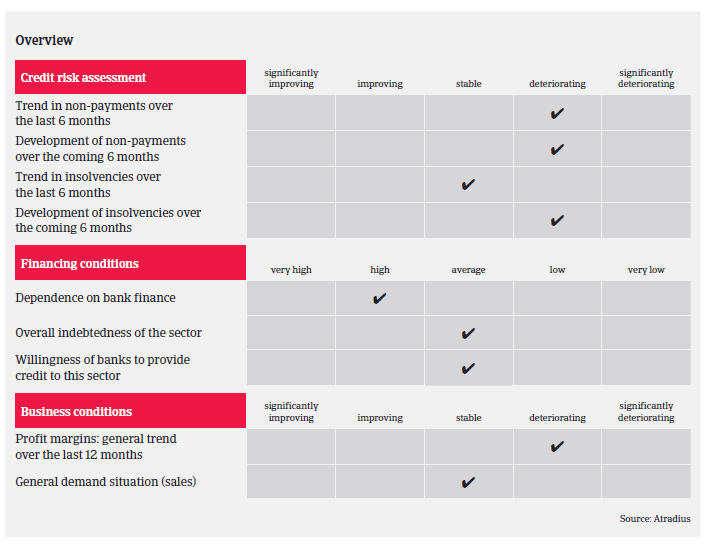 Therefore we pay close attention to the number of credit limits that are applied for within a short period, especially where the buyers are recently established and where management and/or shareholders have recently changed or the buyer’s business sector does not match with the goods ordered (e.g. a steel company ordering food items).